Substance use disorder is a multi-faceted and complex problem. Accordingly, there are influences from many models at work in the ways that we treat addiction and the ways that we view recovery. Much of our thinking is expressed by models, each of which has its own merits. Ideally, these models would complement each other and combine to drive progressive thought and optimize treatment and recovery. In reality, however, the persistence of archaic models, the panacea paradigm and resistance to change have all made progress difficult. With the disease model currently dominating the conversation, comparisons are often made to diabetes, heart disease and mental illness in terms of perceptions, treatment, and outcomes. The outcomes we are getting in addiction treatment would, however, be unacceptable for other diseases. Success is difficult to quantify. There is no cure in the true sense of the word; “remission” is the best medical term to describe a successful outcome. Somehow, though, the medical analogy never quite fits completely; and at the end of the day, it is better at categorizing the problem than driving the solution. There is another field that makes for an interesting comparison with recovery: education. Many people have hypothesized that substance use disorder is a type of learning disorder; but regardless of how we classify the disorder, when one looks at the way we typically treat addiction, it very closely resembles the education process. Medically, we may give the person in recovery medication to manage symptoms of withdrawal or co-occurring mental illness; spiritually, we may encourage personal growth; we may foster social supports; and these peripheral components exist in the world of education as well. Most of the real recovery work is focused on learning and changing individual behavior; and probably always will be, unless and until the next scientific breakthrough changes the game altogether. Still, typical educational outcomes would be a great improvement over what we are seeing with addiction. Fortunately, strategies for maximizing human learning and behavior have been studied and refined for thousands of years. Unfortunately, some elements of the traditional approaches to treatment and recovery still seem to contradict modern educational and behavioral science. Early recovery environments provide microcosms in which to practice new skills. Part of the generally agreed-upon definition of recovery is a return to unimpaired functioning. What are taught as “recovery” principles are actually skills common to the human experience. These skills and principles are intended to be “practiced in all of our affairs”; to be taken out into the larger context of life; to be fully internalized, mastered and integrated. One way to view a relapse is as a failure to successfully implement these skills at a time after their introduction and initial practice. In education, the goal is for each student to become what is known as an “independent life-long learner”; not to outgrow learning, but rather to achieve a level of autonomy at which the learner can independently identify and utilize opportunites for learning. A structure called Bloom’s Taxonomy illustrates mastery in higher levels of learning as transcendence of mere rote memorization and recall. (Recovery example: some people can cite chapter and verse from recovery books, but have a hard time remaining abstinent.) In this fashion, skills may be not only learned and understood, but also applied and analyzed, and the person can be empowered to seize opportunities for recovery expansion, synthesize or create personal recovery structures, and evaluate them as necessary. In higher levels of learning, individual empowerment and autonomy is key. Learned helplessness, on the other hand, fosters dependence and inhibits higher-level skill acquisition. The way it works is: You are unaware of or unwilling to see your problem (Precontemplation), you think about making a change (Contemplation), you plan to make a change (Preparation), you take Action to change, and then Maintain your change. This dovetails nicely with the 12 step approach, because you are, in theory, never finished with your recovery; and when your Maintenance lets up, you Relapse. 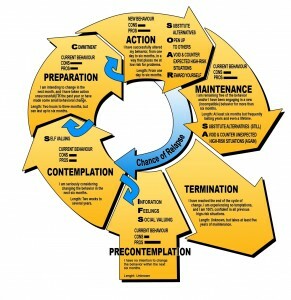 Looking at this particular graphic, relapse seems like the only way to move forward. 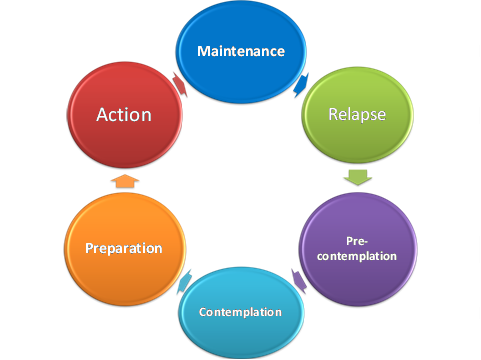 However, Prochaska’s original Transtheoretical Model did not include relapse as one of its stages. Instead, the most advanced stage was Termination. Relapse, in the true-to-theory model, was decidedly optional. The idea of termination of the change process and full integration of the new knowledge and skills acquired is very exciting. What if recovery was, instead of a sisyphean ordeal, something that could be learned and added to the human repertoire? Once one learns to read, it cannot be forgotten. It is practiced in every context. Some are better readers or more voracious than others; but the skill is never lost. It is not only sustainable; it is fully attainable. Our goal for students is for them to be lifelong learners, but ideally, after a point, the learning process becomes autonomous. 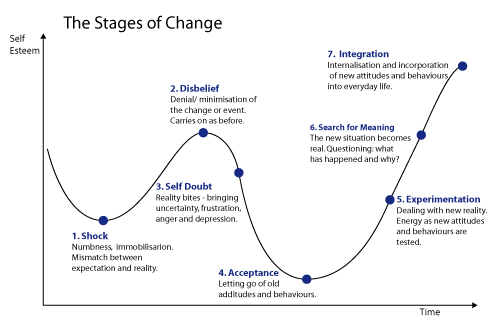 My searches also yielded a model based on Kubler-Ross’ Stages of Grief. The first three stages bear an interesting comparison to the first three steps of the 12-step program. Acceptance is also a universal concept in recovery. The most advanced stage of this model is Integration, which is preceded by Experimentation and a Search for Meaning. These correspond to an increase in Self-Esteem over time. Now that sounds like some nitty-gritty recovery! It seems as though some conceptualizations of, and approaches to, addiction treatment and recovery have often cemented relapse into the change process, while failing to encourage and empower individuals to aspire to the highest levels of recovery. Behavioral and educational science have proven that expectations drive outcomes. When our thinking is shaped by models and paradigms that do not include a component for the highest echelon of success, why should we be surprised at mediocrity and failure? When the outcomes we offer people limit their autonomy and appear arduous and unappealing, why should we be surprised when intrinisic motivation suffers and basic skills are not integrated? 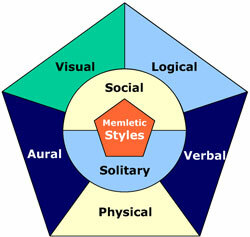 The idea of learning styles, long recognized in education, may also be relevant in treatment and recovery. Students with diverse abilities, backgrounds, and biological makeup learn in different ways according to their strengths. Some are predominantly visual learners; some auditory, some verbal, etc. In order to maximize learning, educators need to teach to differentiate instruction to accomodate learning styles. Similarly, there seem to be many different recovery styles. Think about all the different ways that people recover, and you can probably identify the corresponding styles. Those who struggle in recovery may not have discovered the style that works for them. For example, a solitary-styled person may not do well in a socially oriented recovery program. We like to talk about meeting people “where they are”. Part of this is having the spectrum of skills, approaches and modalities to differentiate; part of it is working in a paradigm that allows for more than one philosophy. Are we meeting people where they are and then struggling to move them to where we are comfortable, or truly meeting their needs by adapting our skills? Are differentiated approaches to recovery available, attractive, and supported by treatment modalities? When I became a special education teacher, there was an anti-stigma slogan in the special needs community which said, “All Children Can Learn”. This all-inclusive philosophy does not brook mediocrity or compromise. It is incumbent upon the educator to find and implement effective strategies that work for each student. Our current outcomes in treatment and recovery would be just as unacceptable in the field of education as they would be in the medical field. Perhaps if our approaches and methodology reflected the firm belief and commitment to the idea that “All People Can Recover”, treatment and recovery outcomes would improve.